Here is where it all began. 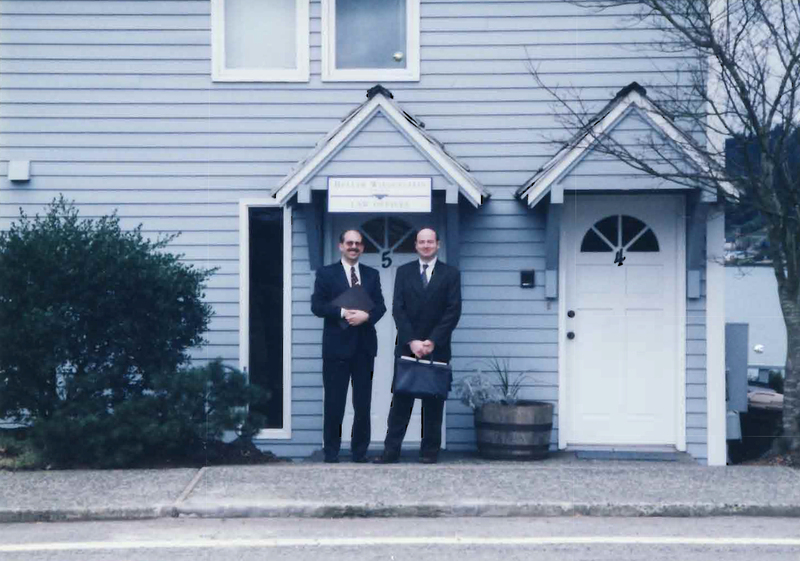 Tom and John in front of their first office at the Grand Kirk in Poulsbo, early 1997. Tom Heller and John Wiegenstein formed Heller Wiegenstein PLLC in January, 1997. Although Tom and John learned their trade in larger firms, they chose to create a new environment where they could provide the expertise of a larger firm but with the personal attention – and value to our clients – of a smaller firm. Twenty years later, Tom has retired and moved with his family to Europe to begin a new chapter in life. John and attorneys Elisha Smith and Jeanine Blackett Lutzenhiser continue to serve the firm’s long-standing clients as well as new clients who appreciate our speedy, direct contact between clients and attorneys, hands on knowledge of each file, reduced overhead, and rapid decision making. We live in Kitsap County, and our office is located in Poulsbo. We also maintain office space in Edmonds, Washington, on the waterfront just south of the ferry terminal. We serve both the metropolitan Puget Sound corridor, the Olympic Peninsula counties, and surrounding areas of Western Washington. We practice in Washington’s state trial and appellate courts, and also in the United States District Court for the Western District of Washington.